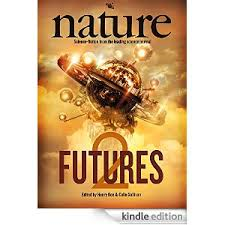 Futures 2 Anthology, featuring the best stories from Nature magazine's Futures column, was launched at WorlCon on Friday evening. The anthology is available in various e formats, and includes my story World Wire Web, along with a host of well known authors and fabulous stories. I was at the launch party where I met editors Henry Gee again and Colin Sullivan for the first time, as well as several of the other authors.